Penguin moms typically lay two eggs. The majority of the time, just one egg survives. When chicks are born they do not look like their parents at all. They are soft and covered with lots of fluffy feathers. The first-born chick typically grows stronger because it has a chance to eat more. Because of that, the second born chick is normally weaker. It struggles to survive when its parents leave for weeks at a time to find food. When parents leave their chicks in search of food, the chicks huddle together in groups called nurseries. While the chicks are bundled in a tight group, some adult penguins stay behind to watch over the chicks and defend them against predators. 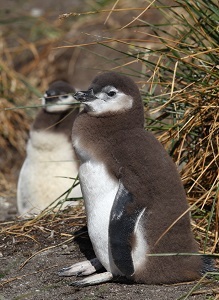 Luckily, chicks also have thick layers of fat to protect against freezing temperatures of the Antarctic. Penguin moms and dads work hard to help their chicks survive. If all goes well, these protection methods should keep the chicks from freezing to death while they wait for their parents to return.